Cavvy Savvy isn’t just a great place to talk horses, we are now a great place to SELL horses! 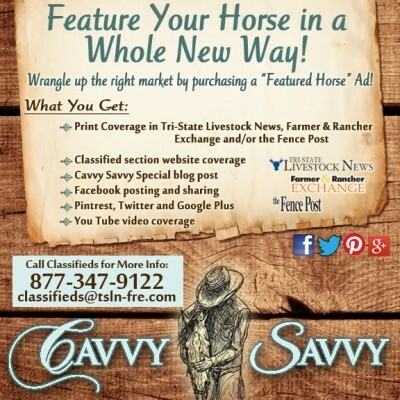 Not only will your ad be showcased on Cavvy Savvy as a “Featured Horse” post, but it will also be promoted on our many social media sites (Facebook, Twitter, Pinterest, Google+). Your ad will also appear online at tsln.com and thefencepost.com, as well as in print for 4 weeks in Tri-State Livestock News’ classifieds. You will need to provide 3 photos and a video, so that we can properly promote your horse. For more details and pricing please contact the TSLN Classifieds Team.